Strawberry Basil Scones have the taste of strawberries with a hint of fresh basil that gives the scones a delightful and unexpected flavor. I made both a dairy-full and a dairy free version for the French Tea Party. My guests enjoyed and complimented the surprising flavor of the scones. I loved them and will definitely make these again. 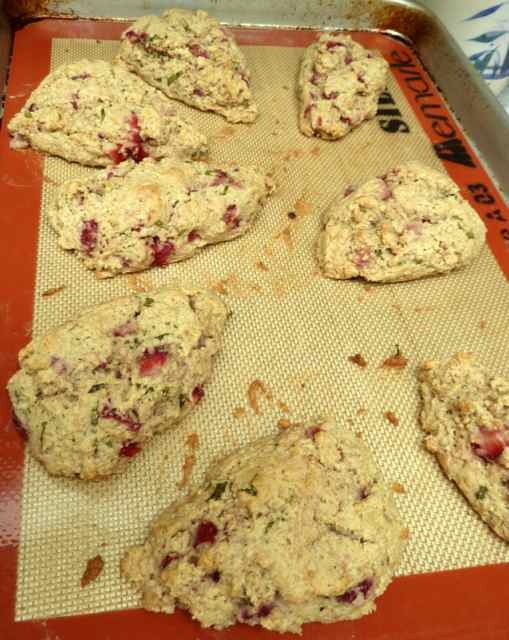 I used the basic recipe for scones from my Lavender Scone recipe, replacing the lavender with finely chopped basil and adding chopped strawberries. Scones are made with flour, butter and milk. To make them GF and dairy free I replace regular flour with a mix of GF flours and replace the milk and butter with dairy free milk and non dairy margarine and shortening (both non-hydrogenated). 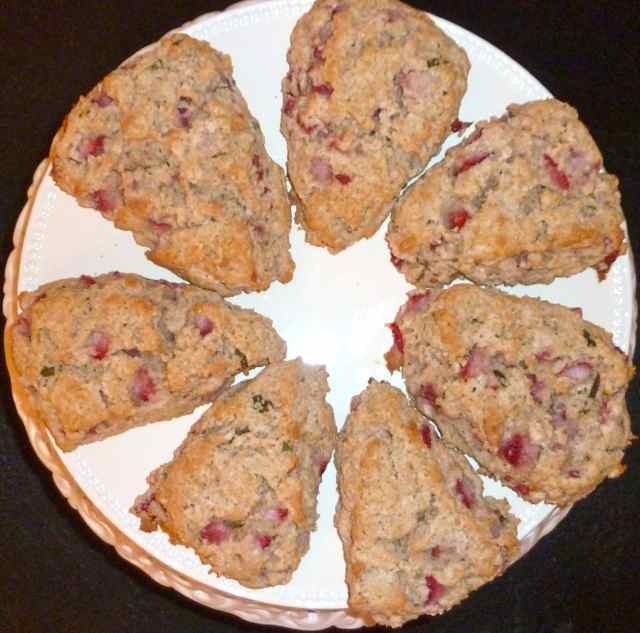 Scones are best made right before you eat them, but they can be reheated and served warm. These do not need any clotted cream or butter as they are moist and flavorful just plain. margarine is salted omit the 1/4 tsp. salt in the recipe. 2 Tbs. Fresh Basil - snipped or chopped finely. 2/3 cups Milk or Cream - For Dairy Free/Vegan: Dairy Free Milk such as soy, almond or coconut or Dairy Free Creamer. Preheat oven to 400 degrees. Line a baking sheet with parchment paper or silpat. Add the flours, xanthan gum, sugar, salt, and baking powder to a large bowl or to the bowl of a food processor. Mix well. Add the cold butter/margarine pieces to the flour mixture. If using a food processor pulse the butter/margarine in until the mixture resembles wet sand then pour out the mixture into a large bowl. If doing by hand cut the butter/margarine in to the flour mixture until they are the size of very tiny beads. 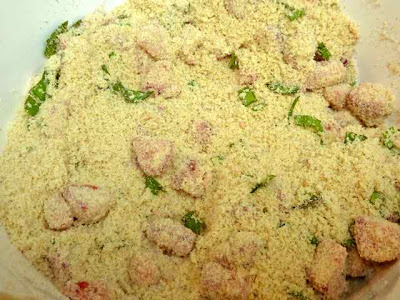 Add the chopped strawberries and basil to the flour mixture in the large bowl. Stir together with a fork until strawberries and basil are coated with the flour. 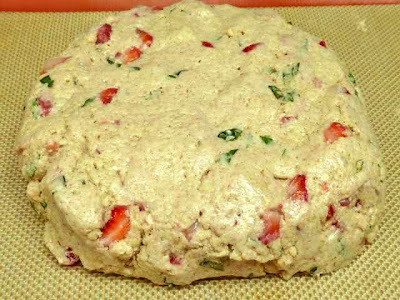 Strawberries and basil added to the flour butter mixture. Add the milk or cream to the bowl and stir together with a fork until just combined. Do not over mix or the scones will be heavy and dense. Scoop out the dough onto the parchment paper. With wet hands gather the dough into a circle and smooth the top. Dough formed into a circle. Cut the circle into 8 wedges with a sharp knife. Dough cut into 8 wedges or triangles. Separate the wedges until they are about 2 inches apart. so they will not run into each other while baking. Let the scones rest for 15 minutes. If you like, you may brush the tops with egg wash or oil for a shinny top. 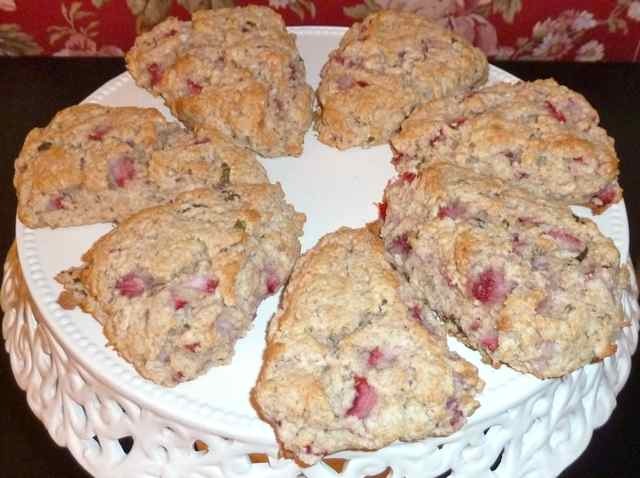 Bake scones for 12-15 minutes or until lightly brown. Baking time will vary according to your oven and how thick you make the scones. Baked scones on baking sheet. They spread and flatten a bit while baking. Serve warm. Warm up any left over scones if serving the next day or so. You can freeze the fresh scones and reheat for later use. They tend to flatten a bit more than the butter scones while baking. GLUTEN FREE STRAWBERRY BASIL SCONES Instructions 1 1/4 cups Sorghum Flour 1/4 cup Tapioca Flour 1/4 cup Chickpea Flour 1/2 tsp. Xanthan Gum 4 tsp. Baking Powder 5 Tbs. Sugar (I used Evaporated Cane Juice Crystals) 1/4 tsp. Sea Salt 2 Tbs. Fresh Basil - snipped or chopped finely 5 Tbs. Unsalted Butter - For Dairy Free/Vegan: Dairy Free Margarine (non-hydrogenated such as Earth Balance Buttery Sticks). If the margarine is salted omit the 1/4 tsp. salt in the recipe. 2 Tbs. Fresh Basil - snipped or chopped finely. 1 cup Chopped Fresh Strawberries 2/3 cups Milk or Cream - For Dairy Free/Vegan: Dairy Free Milk such as soy, almond or coconut or Dairy Free Creamer. Directions Preheat oven to 400 degrees. Line a baking sheet with parchment paper or silpat. Add the flours, xanthan gum, sugar, salt, and baking powder to a large bowl or to the bowl of a food processor. Mix well. Add the cold butter/margarine pieces to the flour mixture. If using a food processor pulse the butter/margarine in until the mixture resembles wet sand then pour out the mixture into a large bowl. If doing by hand cut the butter/margarine in to the flour mixture until they are the size of very tiny beads. Add the chopped strawberries and basil to the flour mixture in the large bowl. Stir together with a fork until strawberries and basil are coated with the flour. Add the milk or cream to the bowl and stir together with a fork until just combined. 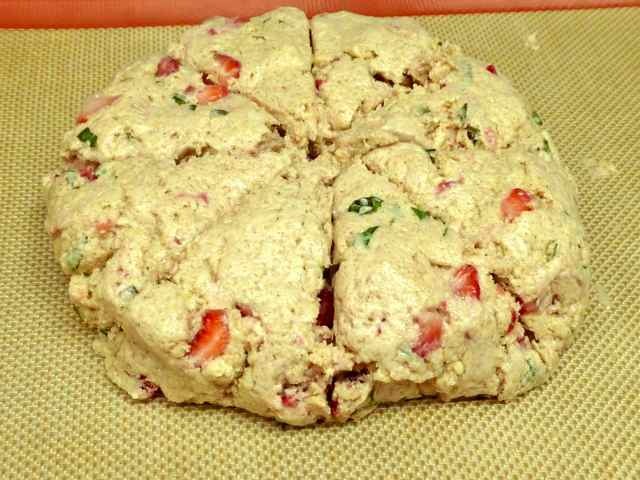 Do not over mix or the scones will be heavy and dense. Scoop out the dough onto the parchment paper. With wet hands gather the dough into a circle and smooth the top. Cut the circle into 8 wedges with a sharp knife. Separate the wedges until they are about 2 inches apart. Let the scones rest for 15 minutes. If you like, you may brush the tops with egg wash or oil for a shinny top. 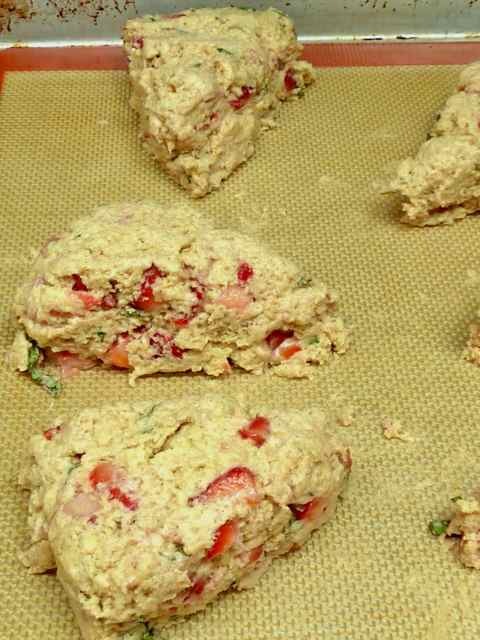 Bake scones for 12-15 minutes or until lightly brown. Baking time will vary according to your oven and how thick you make the scones. Serve warm. Warm up any left over scones if serving the next day or so. 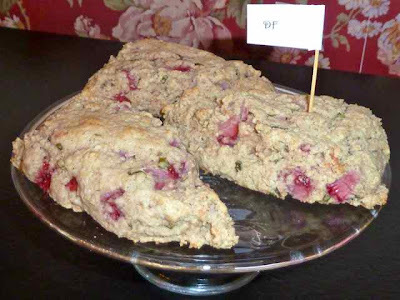 You can freeze the fresh scones and reheat for later use.